A good quality organic gardening compost is at the heart of a healthy organic garden. Here are some tips on how to acquire good quality compost, what to look out for in a compost and how to use it effectively. First there's a look at what it is that compost does for us - and the soil. Then there's a method for producing a reasonably good compost in a very easy way. Lastly, there's a look at other ways to get quality compost. Organic gardening compost is compost for life! Compost has lots of benefits for your garden. It feeds the soil and the micro-organisms in the soil, it helps the soil to retain moisture and it provides structure so that plants can grow effectively. It also benefits wildlife by providing food sources. Picture above: Organic gardening compost is much the same as that found in woodlands. When we make compost we are just copying nature, which makes and uses natural mulches at every opportunity. A good organic gardening compost releases nutrients into the soil for take-up by plants. It is rather like good quality food for us humans - and animals. If you eat well, you are healthy and strong and you do not easily succumb to disease. Your energy levels are good and your food sustains you for hours on end. Eat lots of poor quality, processed foods, laden with fats and sugars but deficient in nutrition and sooner or later your health deteriorates. Your strength and vitality wanes and you spend a lot of your valuable time in doctors' waiting rooms! Just like us, plants need quality nutrition. That nutrition comes from the breakdown and decay of plant and animal wastes. Worms, beetles and a myriad micro-organisms in the soil contribute to the process. If you feed your plants with industrial fertilisers only and don't return natural fertility to the soil, your soil becomes more and more depleted of the nutrients needed for plant health. 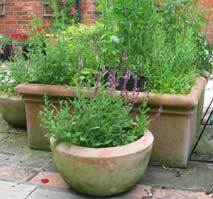 Picture below: Your homemade organic gardening compost can be used for planters and containers too. Getting hold of the good stuff! Making your own organic gardening compost is really very easy. Here is one of the easiest ways to produce a reasonable compost which will help feed your soil. It will add fertility and structure but it won't be weed-free, so it needs to be used carefully. First collect suitable materials over a period of time. You can use any organic matter that you can find except for domestic pet and human waste and meat products. Manure from dogs and cats is too likely to spread diseases. Human waste is also fraught with problems, so stick to farmyard manure and garden and vegetable kitchen wastes. Also, don't include any diseased plants or very virulent weeds. Tomato plants that have suffered from blight should be omitted. 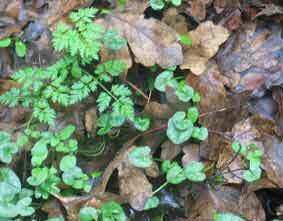 Perennial horrors such as bind weed or ground elder are just not worth the risk! They will simply use your compost heap as an excuse to propagate themselves and spread even faster than they already do. Full instructions for what to collect and use are to be found here. You can use your materials to produce high quality weed-free compost but it takes quite a bit of time and skill to do it right. If you want to learn the proper way to make weed-free compost look here. In the long run, making proper, weed-free compost is worth the extra effort as you can do so much more with it. The materials used for easy compost are the same – except that in this easy method you can probably get away with including potato peelings if you don’t mind the odd compost spud coming up! A fast and easy method for organic gardening compost! Pile up your materials straight away when you get them and just add more whenever it’s convenient. A heap of rotting down materials will turn itself into very acceptable new soil in about a year. You can also make weed banks from turf and weeds - which provide a useful barrier between garden areas. If you find yourself short of top soil for any reason, these banks can be used to provide extra fertile soil. When the heap is big enough or when the compost bin is overflowing with goodies (about four or five foot high is enough) – simply cover it up well. Cover it in a way that is reasonably rainproof and wait...for about a year. You don’t even need a bin really. A pile of compost in a quiet corner of the garden is no trouble at all. The only concern is vermin. If you put a lot of kitchen waste into your compost you may attract vermin such as rats. It's better to use a collecting bin for organic kitchen waste and add it into the mix when the garden waste and manure pile is ready to go. For different types of bin see Compost barrel or compost turner? Which is best?. When you uncover your heap of organic gardening compost for the first time after a year has passed, you may find that the very top and outside edges are not thoroughly composted. They can be kept back and used to start the next batch. With this method you won't kill the weed seeds but you will get new, fertile soil to add to your garden. Provided that you don’t mind hoeing off flushes of weed seedlings a week or two after you have spread it – and again a couple of weeks later – this can be a good easy way to improve soil fertility and structure. If you don’t want the hassle of the weeds, just use it for digging into the soil. If you make sure that it goes a few inches down it shouldn’t cause too many problems, especially if you add a good quality mulch on top. Of course if you turn or disturb the soil much the weed seeds will be brought to the surface. For this reason the full composting method is always to be preferred! You should also be aware that soil pests and diseases will often survive in this type of compost, so be very careful about what you put in there! Organic gardening compost can be obtained in other ways. Here are some easy ways to get ready-made compost. Many local councils now run composting schemes where you can buy organic gardening compost made from local collections of garden waste. This can provide a very useful service for people who don't want to compost their own kitchen and garden waste. It's also a good way to acquire good quality organic gardening compost if you haven't the time or inclination to make your own. Your local council should make sure that this type of compost is fully tested to comply with local safety regulations. It's best to ask if you are not sure as local regulations vary widely and some people put some very toxic things on their garden plants and lawns. Our local scheme, for example, carries out four sets of tests on the compost to make sure that it is free of toxic elements such as chemical residues. It is sold as suitable for using on vegetables as well as flowers. It's quite cheap, especially if you bag it up yourself. You can also use commercial organic gardening composts. They can become rather expensive if you are trying to garden with the mulching method! Also, many commercial composts often include peat which is not an eco-friendly ingredient. Peat boglands are being lost at an alarming rate to commercial short-term interests. Search out non-peat based composts. There are some good ones based on coir and new methods are being evolved which are even more environmentally friendly. Some outlets will offer bulk discounts for larger quantities. There are lots of commercial composts and organic fertilizers available on the market, many of which can be bought on-line. Here are a few contenders. McGeary Organics 2-3-4 Fertilizer can be bought in bulk and is a quick way to add fertility to your garden. Bat Guano For Flowering Plants is an old-fashioned way of adding fertility to your soil. Bat guano was a major source of fertility before oil-based fertilisers became common. Eko Organic Original Soil Mix is an organic soil or potting mix available from Amazon. Organic mushroom farms often sell semi-spent organic compost. This can produce excellent crops and is an inexpensive way to find good nutrients for your garden plants, especially if you can buy it locally. For useful plants among the so called weeds, see Plants for a Future, an amazingly useful website.